This setting is required to ensure the correct display of your net financial result adjusted for trade transaction fees. Select the Settings menu item in the main window. 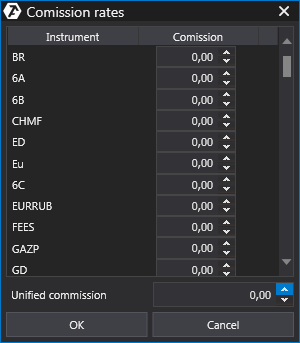 In this window, you can set either a single commission for all instruments in the Unified Commission cell or individual commissions for each instrument. After setting all commissions, save the settings by clicking OK. Important: The commission is indicated for one side of the transaction only! * Please check the instrument commission amount with your broker!